I’ve used Dawn at home on my dishes ever since I can remember. 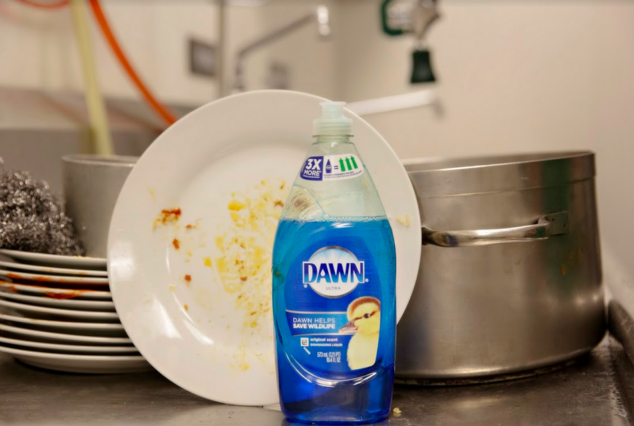 Dawn has always been my go-to dish soap because I trust that it will get the job done. It’s really simple for me, I keep buying what I love because it works. Cleaning dirty dishes is a household chore that I don’t necessarily love to do with 7 people in my family, but it’s something that needs to get done, and so it does. You can only imagine throughout the week how many pots, pans and cups, and cookie sheets get washed in our house. And I’ve always had one set rule at home, which is a household rule that my own mom taught me… never leave a sink full of dishes, get them done! Thanks to Dawn, they always get done. Dawn’s trusted and superior clean is not the only reason why I love Dawn. They do so much more by helping communities during times of need and it’s something that I have always admired about them as a brand. They truly help people beyond just the sink. Speaking of helping people, I’m thrilled to share with you that Dawn has just launched their “Step Up To The Sink” program which encourages people to “step up” and help those who need it – starting with the dishes. This incredible program encourages everyone – from family to neighbors to community volunteers – to step up and pay a good deed forward. Personally – I just love the mission behind “Step Up To The Sink” because it’s showing everyone that good deeds CAN be big and small… but they’re always impactful. Even tackling the dishes for another is a small, yet impactful act of kindness that we can all rally behind. While cleaning dishes is an inevitable household chore, it actually holds the key to something much more meaningful – especially when it comes to doing the dishes for someone who needs a little help. I think back to the early days of motherhood when I had 4 boys all within 3 1/2 years. The dishes would just pile up and pile up and pile up. My husband and I were just trying to get through the day with 4 baby boys – we would ALWAYS fall behind on the chores. When my mom and dad would come over to help us out, they first thing they would always do was help us with our laundry and clean all of the dirty dishes. That “small” act would completely change my outlook for the day. I was so thankful for a helping hand. Following in the brand’s long tradition of helping communities during times of need, they are proud to be launching this “Step Up To The Sink” program by stepping up for federal workers and their families. Here in Rhode Island, we had many federal workers out of work with no pay. 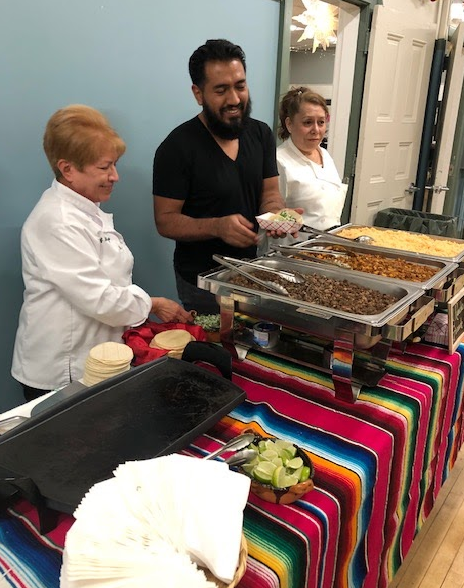 When Dawn asked me to “Step Up To The Sink” and host a free meal for federal workers in Rhode Island, I said “YES” without a hint of hesitation. Rhode Island is my home and it where I grew up and now raising my own kids. I’ve been watching our local news and reading about the local impact of the furlough and it’s been heartbreaking. To be able to do what I can with the help of Dawn was something I just couldn’t pass up because I love my community so much and I just wanted to be able to do something good… pay a good deed forward. 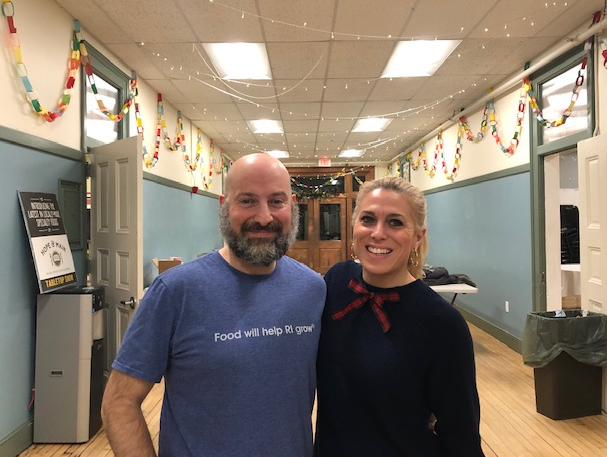 Dawn allowed me to host a spectacular meal in Rhode Island on Wednesday, January 23rd at Hope & Main in Warren, RI with the help of local food vendors. Hope & Main is ana RI culinary incubator with commercial kitchen space and very strong ties to the RI food community. They are incredible at bringing the community together for so many causes, so I knew this would be the perfect place to host the event at for the evening. The local food vendors that worked with me for this event were just amazing! They all brought their A-game, all wanting to help and be part of this incredible dinner for our local Rhode Islanders. A huge shout out to The Backyard Food Company, Avenue N Restaurant, Easy Entertaining, K&S Pizza, El Rancho Grande, GottaQ BBQ, Blount Soup and EatDrinkRI. I couldn’t have done it without the support and help from all of these incredible local businesses. It was pretty amazing to see so many people come together to do a good deed and I want to thank Dawn for helping those in our community that were impacted by the furlough. But truly – the best part was seeing the families arrive and enjoy a delicious meal. It was great meeting everyone and chatting with them. It was great seeing their kids running around and enjoying the event. It was awesome seeing people go back for seconds. And it was a great feeling seeing the families be so appreciative when we took care of the dishes for them! Eat and enjoy… all clean up and washing was on us! When you jump in hands first to a pile of dirty, caked on, stacked up dishes, it becomes an easy way to help out and show appreciation. A thank you. A helpful hand during a difficult time. I just want to send you a big THANK YOU to everyone who put together the event. The food was amazing, the people were so welcoming and awesome, and it was so low key and relaxing. We had such an amazing experience and really appreciate what you and everyone did for the furloughed employees and their families. It was really appreciated and needed during this hard time! That’s what it’s all about. It’s about coming together. It’s about helping out. It’s about rolling up your sleeves and doing what you can. It’s about doing a good deed for people you don’t know, but know are going through a tough time right now. I brought along my 2 oldest children to the event because I wanted them to help out, too. I wanted them to be part of the night and wash dishes and cook food and do what they could, too. It was ALL hands on deck in my opinion last night! Dawn invites YOU to Step Up To The Sink and help those in your life that need it most. You can use #StepUpToTheSink on social media and share how you were able to make a difference for someone special and encourage others to join in. Remember – regardless if it’s big or small – it will make an impact. Helping others is one of the most powerful things we can do as human beings, I love that Dawn is Stepping Up to inspire and motivate others! Disclosure: Brand Partnership with Dawn. All opinions are 100% my own. What a wonderful initiative. We are a Dawn household, we love how it cuts through our messy dishes. I love that your family had a good time at this dinner. I love the concept behind stepping up to the sink. A small act of kindness like doing the dishes can go a long way in someone’s day. I think you stepping up to the plate for Federal workers is a wonderful thing! Dawn is the gold standard in our house, too! We have 9 children in our family and we like our dishes good and clean. I love what they are doing with this program. Kind deeds, no matter how small, can change someone’s day, just like you said! Dawn is our go to for soap. It works great on the dishes. We love using it. That’s what we have right now in the house. Stepping Up to the Sink sounds like a great program. What a wonderful thing you did for those federal workers and their families. Dawn is the only dish detergent that I use. What a wonderful event. We have always used Dawn in our home and I always love their initiatives when it comes to community. A good dish soap is everything. I am using another dish soap than Dawn at the moment, but I can’t find it any more at the store new me. I will but Dawn next I will go shopping, maybe will be my new favorite too. I love dawn, I use it in the kitchen and as a stain remover in the laundry room.